Students can review and check their knowledge about subtracting numbers up to 5 by counting pictures or subtracting numbers. This test has bright and cheerful pictures. It's presented in the form of multiple choice questions. 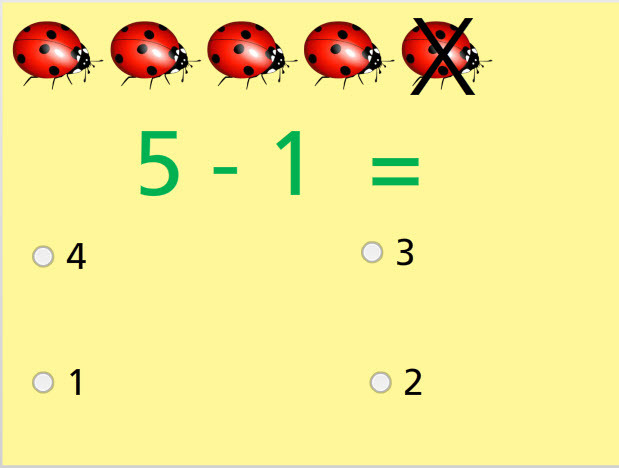 Students can subtract the numbers and have the support of counting the pictures if needed. As their subtraction skills are developed, they should only need to work with the numbers. Return from this Subtract with Pictures Numbers up to 5 Test to the Elementary Math Tests, Kindergarten Math Tests webpage, or to Math Tests.